(CBS News) Neil Armstrong, the Apollo 11 astronaut who became the first human being to set foot on another world, has died. He was 82. In a statement his family said Armstrong had passed away following complications resulting from cardiovascular procedures. The family described him as a loving husband, father, grandfather, brother and friend, and also as "a reluctant American hero who always believed he was just doing his job." When Armstrong set foot on the moon on July 20, 1969, he fulfilled the goal that had been set by President John F. Kennedy just eight years earlier. It was a long, long way from Armstrong's birthplace near tiny Wapakoneta, Ohio in 1930. Armstrong's fascination with airplanes began with his first flight at age six, and that fascination never abandoned him. He left Purdue University in 1950 when the Korean War broke out, and flew 78 combat missions as a naval aviator. After the war, he became a test pilot and flew the hottest aircraft around, including the sleek X-15 rocket plane. He took the powerful craft to 207,000 feet - almost 38 miles - and the edge of space. He was in the first group of civilian astronauts, and made his initial flight in 1966, aboard Gemini VIII. The mission almost ended in disaster when a thruster on his craft stuck open, sending the ship whirling through space. With his trademark coolness, Armstrong used a back-up system, stopped the one-revolution-per-second spin and made an emergency landing in the Pacific. The preparation for the moon landing included learning how to fly the ungainly lunar module, which would descend vertically to the moon's surface. Armstrong had another brush with death when the training vehicle rolled to its side, and he was forced to eject just two hundred feet from the ground. And then, finally, after years of training, the moment arrived: On July 16, 1969, a giant Saturn V rocket lumbered off the pad at the Kennedy Space Center, carrying the thirty-eight-year-old Armstrong and crewmates Buzz Aldrin and Mike Collins. To watch a video of Armstrong reminiscing about his moon landing with CBS News' Ed Bradley click on the video player below. Armstrong later said that the landing itself was the high point of the mission for him. He coaxed the lunar module past craters and boulders as Aldrin called out speed and altitude. After almost a day there, the astronauts lifted off, rejoined Collins in the command module and began the long journey home. Despite the initial fanfare, after the historic flight of Apollo 11 Armstrong remained a humble and intensely private person. He left NASA and taught engineering at the University of Cincinnati and later served on the boards of several aerospace firms. One of his rare public appearances was at a gathering with Aldrin and other Apollo astronauts to mark the 30th anniversary of their moon landing. "In my own view, the important achievement of Apollo was a demonstration that humanity is not forever chained to this planet, and our visions go rather further than that, and our opportunities are unlimited," Armstrong said. Among the hard-charging, super-achieving Apollo astronauts there was bound to be some envy about whom NASA would select to lead the historic mission, but Mike Collins flatly stated what so often was said about his reticent and self-effacing commander: "I can't offhand think of a better choice to be the first man on the moon." 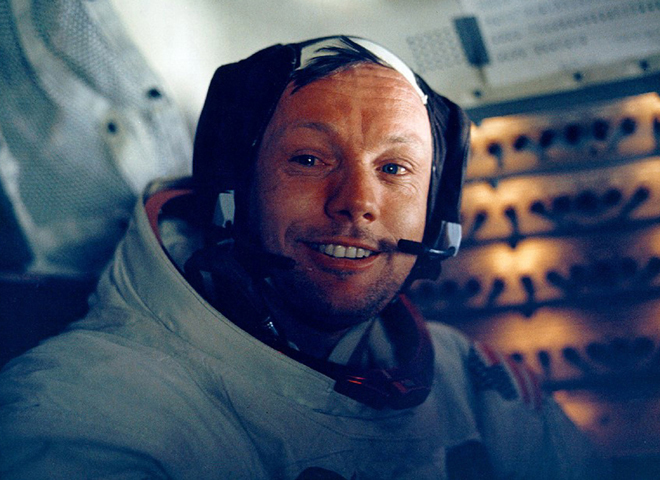 Armstrong's family said, "While we mourn the loss of a very good man, we also celebrate his remarkable life and hope that it serves as an example to young people around the world to work hard to make their dreams come true, to be willing to explore and push the limits, and to selflessly serve a cause greater than themselves. "For those who may ask what they can do to honor Neil, we have a simple request: Honor his example of service, accomplishment and modesty, and the next time you walk outside on a clear night and see the moon smiling down at you, think of Neil Armstrong and give him a wink."